For nearly a month I’ve been jamming in my car to the tunes of the wonderful children’s group, The Laurie Berkner Band. You know you’re a parent when kids music CDs overrun your own in your car. But thankfully, Laurie’s music is silly, smart and musical. We saw her band at the incredible Life Is Good Music Festival, in nearby Massachusetts. I don’t know if Laurie is coming to Vienna anytime soon, but in the meantime, if you want to sing songs about fish who brush their teeth, eating rutabaga with tabasco sauce and stomping boots, check out her album. The Oakton Marching Band Classic. I’m mad for marching, so was happy to go to nearby Oakton High School last weekend for the festival on the outdoor football field. 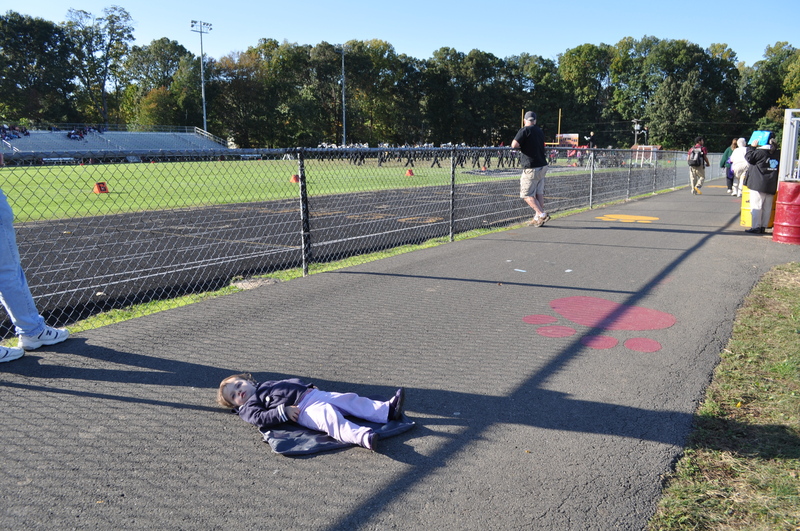 Bug was quite excited at first, then calmly took her diaper changing mat out of my bag, laid it in the walkway in front of the bleachers and laid down. In the middle of the walkway. If you missed this annual festival but still want some good marching band fun with the kids, maybe check out a local football game (if they’ll be up that late on a Friday night). Wolf Trap Barns. If you’ve only been to Wolf Trap in the summer, you are missing a great time indoors at The Barns. Tickets often range from $20 – $35, and the intimate, 400-seat theater is casual and cozy. I saw The Wood Brothers – amazing folk/ country/ whatever band. They wailed. I also saw Enter the Haggis: think Green Day meets the bagpipes. Vienna Halloween Parade. The annual Vienna Halloween Parade is this Wednesday, October 26 starting at 7:00pm on Maple Avenue. This is my favorite Vienna tradition. I love to hear the Washington Redskins Marching Band. This year, we get to bring Bug in her costume. She had a trial run this weekend at the Vienna Moms Halloween party. 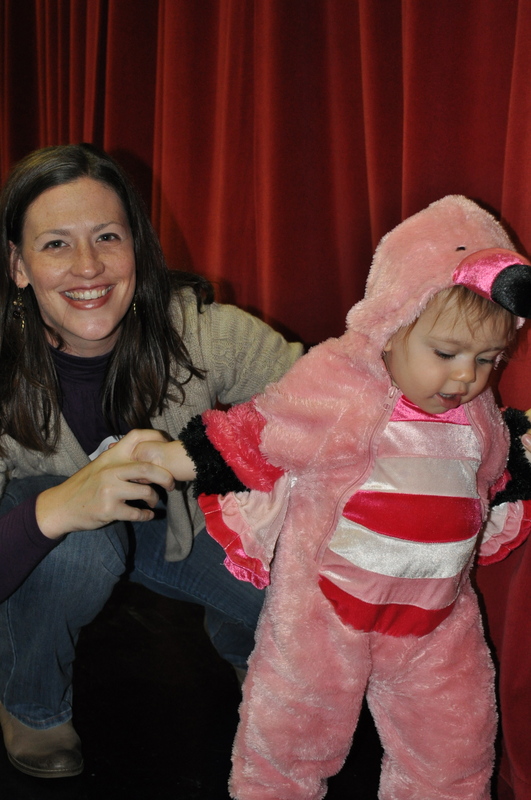 As the only flamingo there, she had a good time running around with the (guessing) 100 kids.